While most cases of uveitis are idiopathic, a history focused on identifying a potential underlying systemic cause (eg, in young adult men, conjunctivitis, urethritis, and polyarthritis suggest reactive arthritis) is necessary in order to determine if workup is needed. Panuveitis may present with any or all these symptoms. Evaluate vital signs and check visual acuity and extraocular movement. Perform a funduscopic examination and measure intraocular pressure. Most importantly, perform a slit-lamp examination. Findings of the examination of the lids, lashes, and lacrimal ducts are normal. The conjunctival examination reveals 360° perilimbal injection, which increases in intensity as it approaches the limbus. Differentiate this condition from conjunctivitis, in which the pattern is reversed, with the most severe inflammation at a distance from the limbus. Visual acuity may be decreased in the affected eye. Extraocular movement is generally normal. On the pupillary examination, the patient may experience direct photophobia when the light is directed into the affected eye, as well as consensual photophobia when light is directed into the uninvolved eye. Consensual photophobia is helpful in distinguishing between iritis and more superficial causes of photophobia, such as conjunctivitis. In the latter, direct, but not consensual, photophobia is noted. Pupillary miosis is common. Examine the cornea by direct illumination with a broad beam at a 30°-40° angle between the viewing microscope and the light source. Examine the epithelium for abrasions, edema, ulcers, or foreign bodies. Inspect the stroma for deep ulcers and edema. Scan the endothelium for keratitic precipitates (white blood cells on the endothelium), a hallmark of iritis (see the image below). Small to medium keratitic precipitates are classified as nongranulomatous, whereas granulomatous keratitic precipitates are large and have a greasy or "mutton-fat" granular appearance. The most important structure to examine is the anterior chamber, which is bound by the cornea and the iris and is filled with aqueous humor. Examine the anterior chamber using a vertically and horizontally short beam. Normally, the aqueous humor is optically clear. 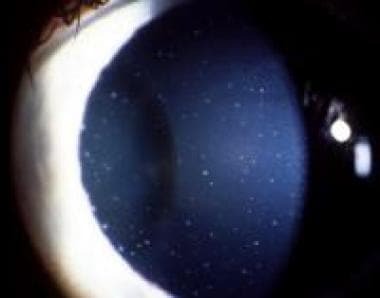 In uveitis, however, an increase in the protein content of the aqueous causes an effect upon examination known as flare, which is similar to that produced by a moving projector beam in a dark smoky room. White blood cells that layer in the anterior chamber are called hypopyon. Opacities of the lens (cataracts) may be present but are not specific for uveitis. Intraocular pressure may be normal or slightly decreased in the acute phase owing to decreased aqueous humor production; however, pressure may become elevated as the inflammation subsides. See the image below. Small stellate keratic precipitates with fine filaments in a patient with Fuchs heterochromic iridocyclitis. Although uveitis is often associated with an underlying systemic disease, approximately 50% of patients have idiopathic uveitis that is not associated with any other clinical syndrome. Acute nongranulomatous uveitis is associated with diseases related to human leukocyte antigen B27 (HLA B27), including ankylosing spondylitis, inflammatory bowel disease, reactive arthritis, psoriatic arthritis, and Behçet disease. Herpes simplex, herpes zoster,  Lyme disease, and trauma also are associated with acute nongranulomatous uveitis. Chronic nongranulomatous uveitis is associated with juvenile rheumatoid arthritis, chronic iridocyclitis of children, and Fuchs heterochromic iridocyclitis. Chronic granulomatous uveitis is observed with sarcoidosis, syphilis, and tuberculosis. Posterior uveitis is found in such diseases as toxoplasmosis, ocular histoplasmosis, syphilis, sarcoidosis, and in immunocompromised hosts with CMV or candidal or herpetic infection. Embolic retinitis also may cause posterior uveitis. An acute rise in intraocular pressure secondary to pupillary block (posterior synechiae), inflammation or topical corticosteroid use is the single most important complication. Examine all patients presenting with a red eye with a slit lamp to detect the presence of cells or flare. Consider all other causes of a red eye  before uveitis is diagnosed. An acute rise in intraocular pressure can lead to optic nerve atrophy and permanent vision loss. Dunn JP. Uveitis. Prim Care. 2015 Sep. 42 (3):305-23. [Medline]. Wills Eye Hospital. The Wills Eye Manual: Office and Emergency Room Diagnosis and Treatment of Eye Disease. 5th ed. Philadelphia, Pa: Lippincott; 2008. Mozayan A, Farah S. Acute anterior uveitis following intravitreal injection of bevacizumab. Ophthalmic Surg Lasers Imaging Retina. 2013 Jan-Feb. 44(1):25-7. [Medline]. Syed BA, Kumar S, Bielory L. Current options and emerging therapies for anterior ocular inflammatory disease. Curr Opin Allergy Clin Immunol. 2014 Oct. 14 (5):485-9. [Medline]. Jabs DA, Nussenblatt RB, Rosenbaum JT; Standardization of Uveitis Nomenclature (SUN) Working Group. Standardization of uveitis nomenclature for reporting clinical data. Results of the First International Workshop. Am J Ophthalmol. Sept 2005. 140:509-16. [Medline]. Yanoff and Duker. Uveitis and other intraocular inflammations. Ophthalmology. 3rd ed. Mosby; 2008. McCannel CA, Holland GN, Helm CJ, Cornell PJ, Winston JV, Rimmer TG. Causes of uveitis in the general practice of ophthalmology. UCLA Community-Based Uveitis Study Group. Am J Ophthalmol. 1996 Jan. 121(1):35-46. [Medline]. Logothetis HD, Leikin SM, Patrianakos T. Management of anterior segment trauma. Dis Mon. 2014 Jun. 60 (6):247-53. [Medline]. Rodriguez A, Calonge M, Pedroza-Seres M, Akova YA, Messmer EM, D'Amico DJ, et al. Referral patterns of uveitis in a tertiary eye care center. Arch Ophthalmol. 1996 May. 114(5):593-9. [Medline]. Acharya NR, Tham VM, Esterberg E, Borkar DS, Parker JV, Vinoya AC, et al. Incidence and prevalence of uveitis: results from the Pacific Ocular Inflammation Study. JAMA Ophthalmol. 2013 Nov. 131 (11):1405-12. [Medline]. Gritz DC, Wong IG. Incidence and prevalence of uveitis in Northern California; the Northern California Epidemiology of Uveitis Study. Ophthalmology. 2004 Mar. 111 (3):491-500; discussion 500. [Medline]. Al-Dhibi HA, Al-Mahmood AM, Arevalo JF. A systematic approach to emergencies in uveitis. Middle East Afr J Ophthalmol. 2014 Jul-Sep. 21 (3):251-8. [Medline]. Yawn BP, Wollan PC, St Sauver JL, Butterfield LC. Herpes zoster eye complications: rates and trends. Mayo Clin Proc. 2013 Jun. 88(6):562-70. [Medline]. Abad S, Seve P, Dhote R, Brezin AP. [Guidelines for the management of uveitis in internal medicine]. Rev Med Interne. 2009 Jun. 30(6):492-500. [Medline]. Dunne JA, Travers JP. Topical steroids in anterior uveitis. Trans Opthalmol soc UK. 1979. 99(4):481-4. [Medline]. Hand L. Anti-TNF Agents Recommended for Ocular Disease. Available at http://www.medscape.com/viewarticle/818314. Accessed: January 6, 2014. Levy-Clarke G, Jabs DA, Read RW, Rosenbaum JT, Vitale A, Van Gelder RN. Expert Panel Recommendations for the Use of Anti-Tumor Necrosis Factor Biologic Agents in Patients with Ocular Inflammatory Disorders. Ophthalmology. 2013 Dec 17. [Medline]. Lyon F, Gale RP, Lightman S. Recent developments in the treatment of uveitis: an update. Expert Opin Investig Drugs. 2009 May. 18(5):609-16. [Medline]. Lim LL, Smith JR, Rosenbaum JT. Retisert (Bausch & Lomb/Control Delivery Systems). Curr Opin Investig Drugs. 2005 Nov. 6(11):1159-67. [Medline]. Mohammad DA, Sweet BV, Elner SG. Retisert: is the new advance in treatment of uveitis a good one?. Ann Pharmacother. 2007 Mar. 41(3):449-54. [Medline]. Wirbelauer C. Management of the red eye for the primary care physician. Am J Med. 2006 Apr. 119(4):302-6. [Medline]. Foster CS, Alter G, DeBarge LR, Raizman MB, Crabb JL, Santos CI, et al. Efficacy and safety of rimexolone 1% ophthalmic suspension vs 1% prednisolone acetate in the treatment of uveitis. Am J Ophthalmol. 1996 Aug. 122(2):171-82. [Medline]. Merck Manuals: Uveitis. Available at http://www.merck.com/mmhe/sec20/ch232/ch232a.html. Nishimoto JY. Iritis. How to recognize and manage a potentially sight-threatening disease. Postgrad Med. 1996 Feb. 99(2):255-7, 261-2. [Medline]. Nussenblatt R, Whitcup S, Palestine A. Uveitis: Fundamentals and Clinical Practice. 2nd ed. St. Louis, Mo: Mosby; 1996. Tessler H. Classification and symptoms and signs of uveitis. Duane T, ed. Clinical Ophthalmology. New York, NY: Harper and Row; 1987. 1-10. Disclosure: Serve(d) as a director, officer, partner, employee, advisor, consultant or trustee for: Pfizer Pharmaceutical<br/>Received research grant from: National Institutes Health. The authors and editors of Medscape Reference gratefully acknowledge the contributions of previous author, Kilbourn Gordon III, MD, to the development and writing of this article.